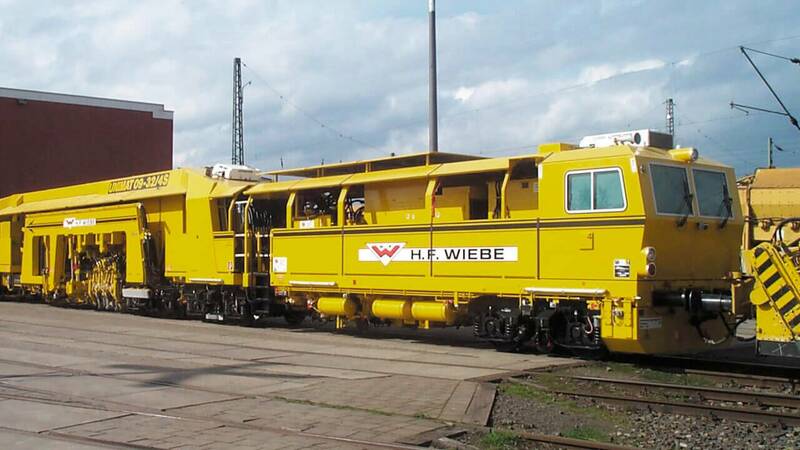 At home on all railway tracks – true to this motto, the Wiebe Group’s machine pool is very diverse. 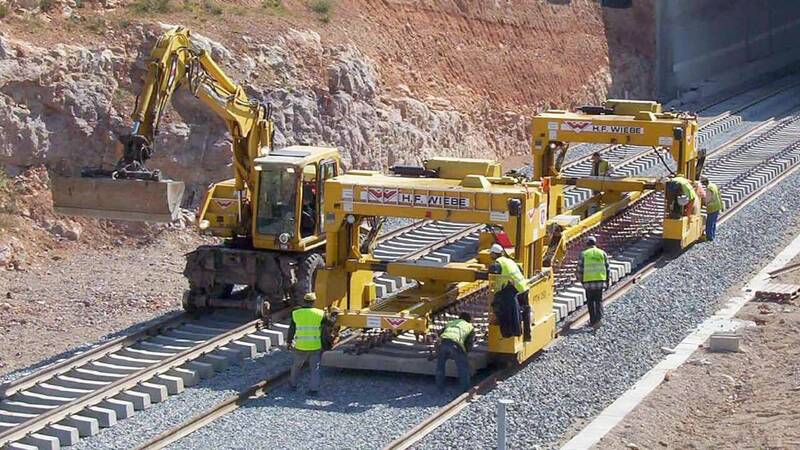 Be it track maintenance or a completely new section of track, all our special machines are high-performance. Large-scale tasks require heavy-duty equipment. 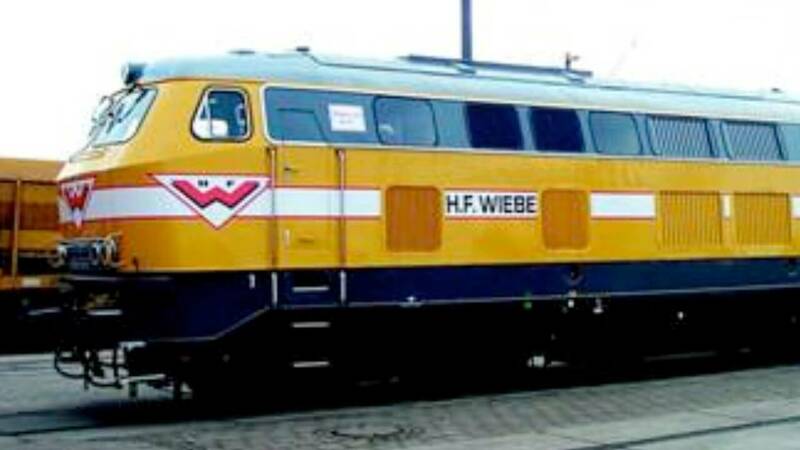 Our machine pool means that the Wiebe Group is in a position to achieve great things even in the face of difficult tasks. 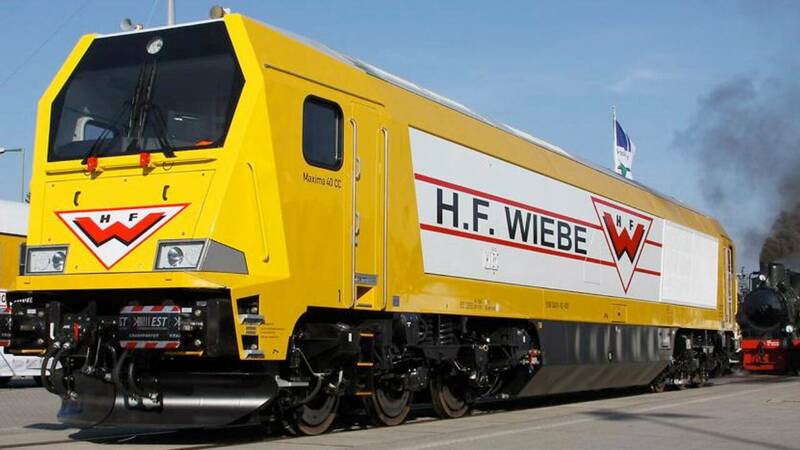 The track and rail networks in Germany and across the world are highly complex systems. The various sensitive parts of the construction and also the far-reaching and constantly growing expansion of the entire infrastructure make careful processing with excellent quality standards essential. 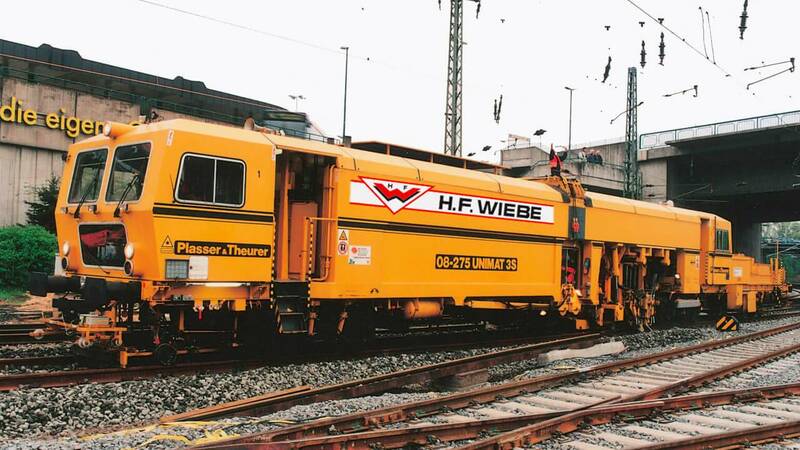 To complete this task smoothly, the Wiebe Group relies on state-of-the-art track construction and track maintenance machines. 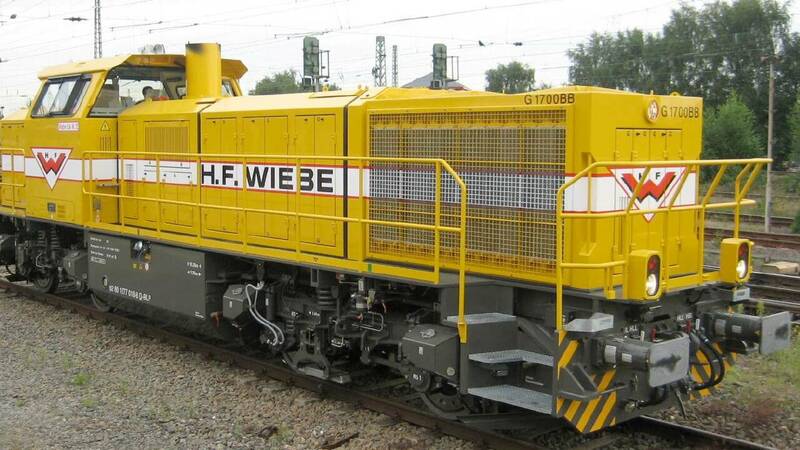 Whether the tasks involve the modernisation of a section of track, track bed cleaning, formation level improvement or track tamping – the Wiebe Group’s machine pool has all the machines required to complete any track construction project together with our qualified employees. 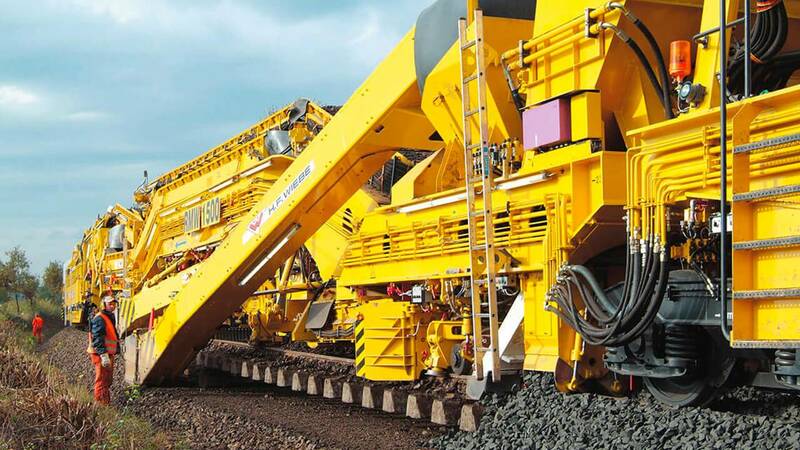 This recycling formation level improvement machine delivers high quality results when preparing and processing track beds and ballast material. 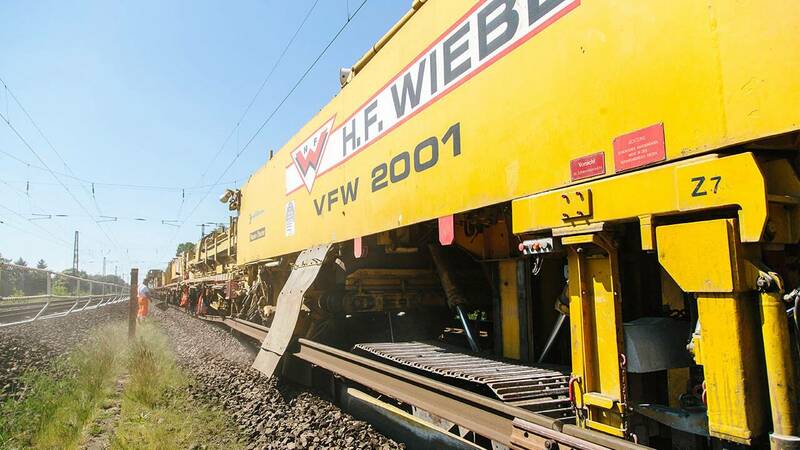 Special machines that can supplement the work trains of the RPM 2002 and RPMW 2002-2 ensure that the material required for formation level improvement and track bed replacement can be transported directly on the track. 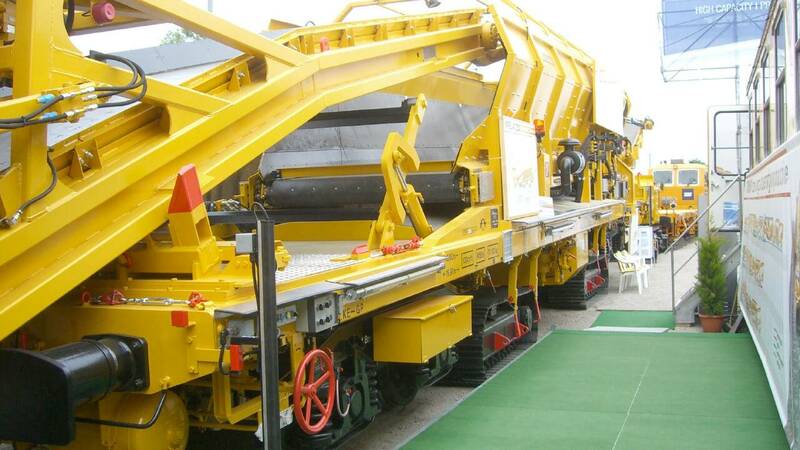 The material wagon moves independently on tracks and ensures uninterrupted operation. 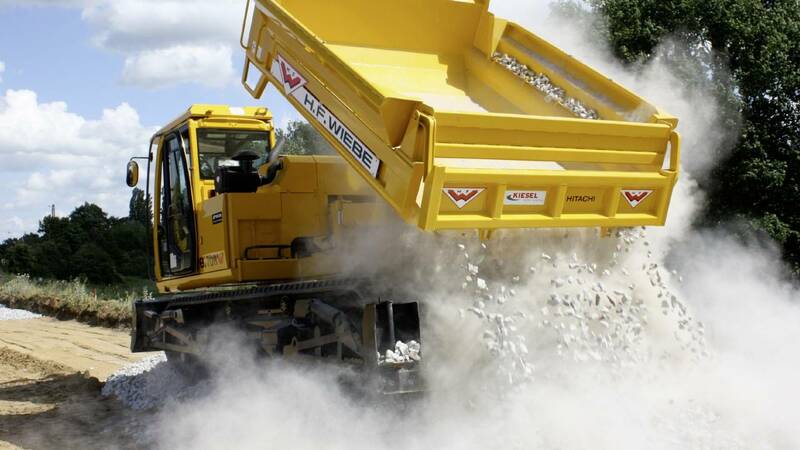 Automatic pre-selections allow smooth use of this material wagon with an integrated digger. 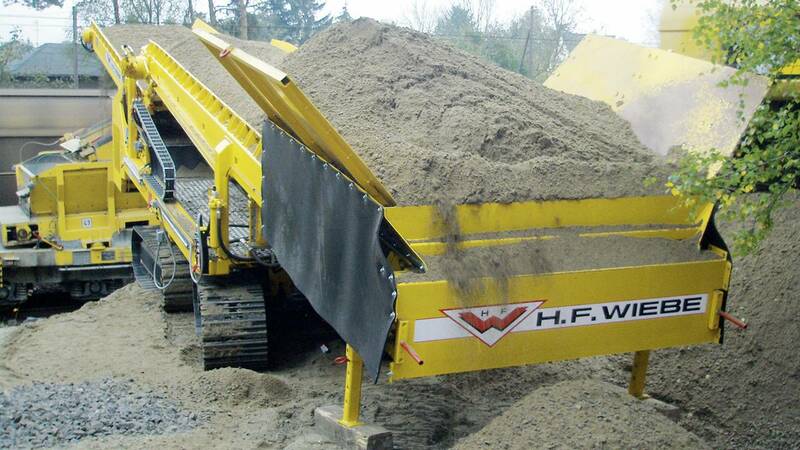 Thanks to its rubber tracks, this dumper can move easily on various surfaces. Three screen systems, each with three screen trays and two excavation chains, are what makes this cleaning machine so powerful. 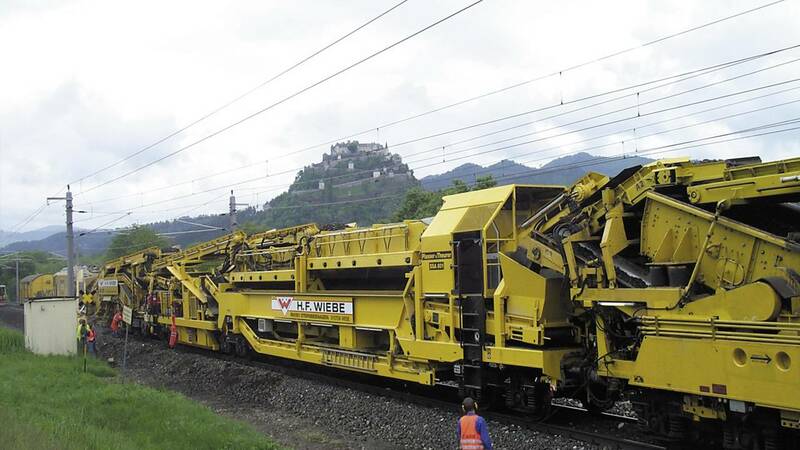 The fitted star screen allows the RM 801 cleaning machine to clean 800 cubic meters of track bed every hour. 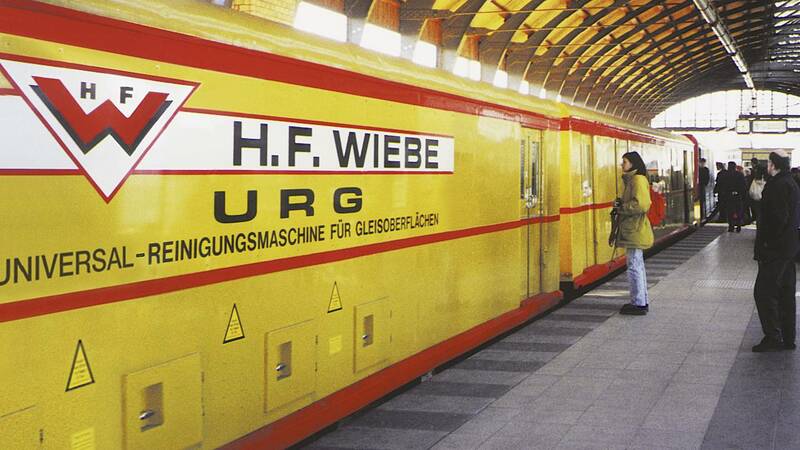 The cleaning machine, which belongs to the urban railway company in Berlin, works excellently thanks to the moving suction nozzles that can be controlled automatically. 14 sleepers a minute whilst also creating an installation formation level – the fast construction machine SUZW-500 stands out thanks to its performance. 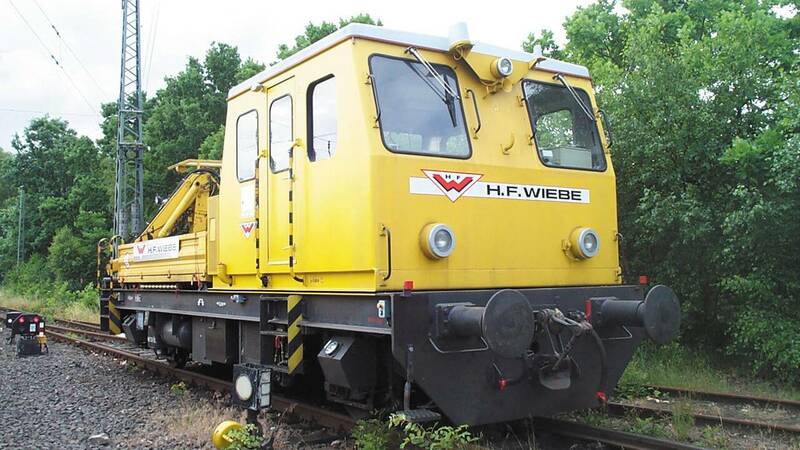 The fast construction machine VFW 2001 can be used to build remove or modernise tracks either with or without prior or subsequent track bed cleaning. 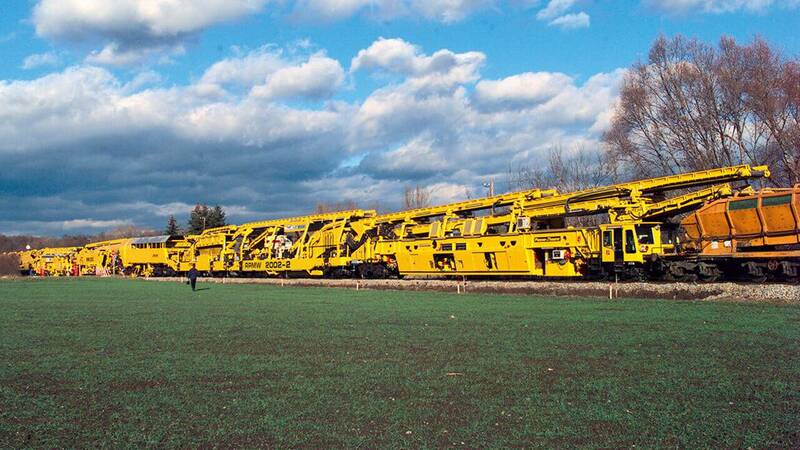 The track laying crane can install up to one kilometre of sleepers in 12 hours. 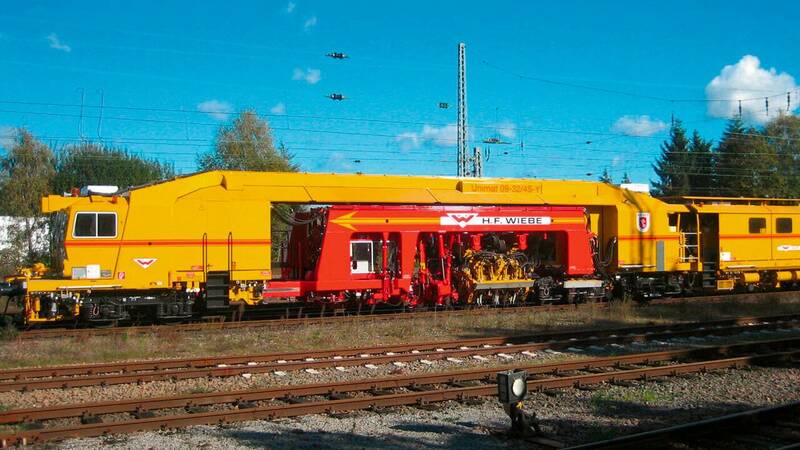 It also loads and transports entire track yokes. 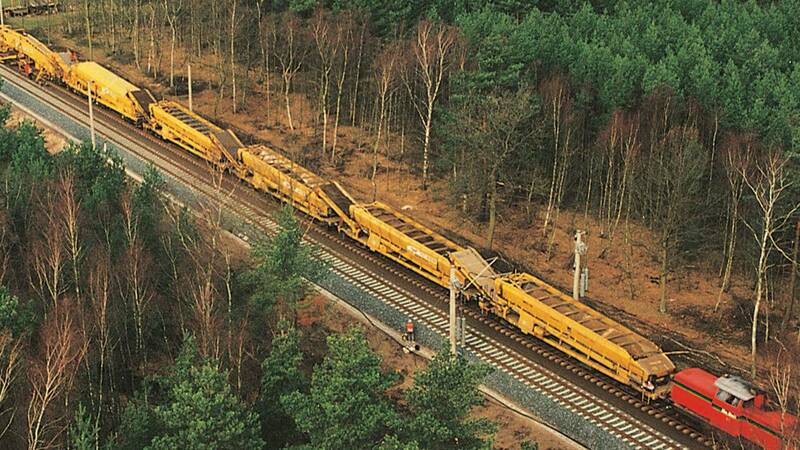 Be it one or three sleepers at the same time, the Tamping Express 09-3X completes the track tamping work quickly and evenly. 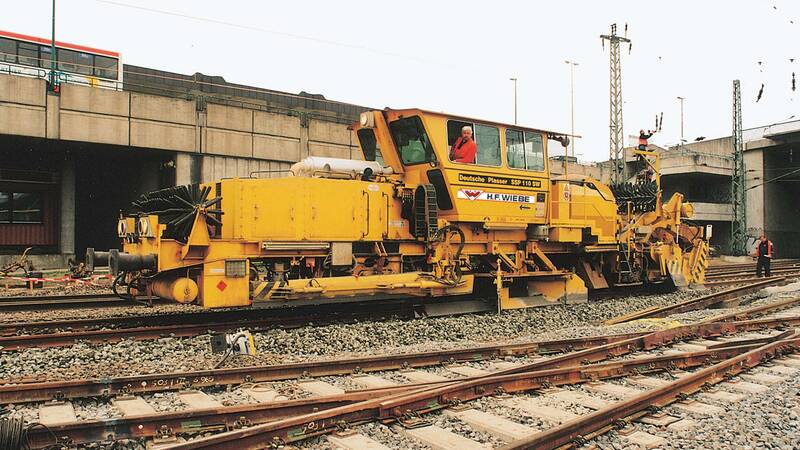 In addition to conventional models, large B75 sleepers can also be tamped with this universal track and switch tamping machine. 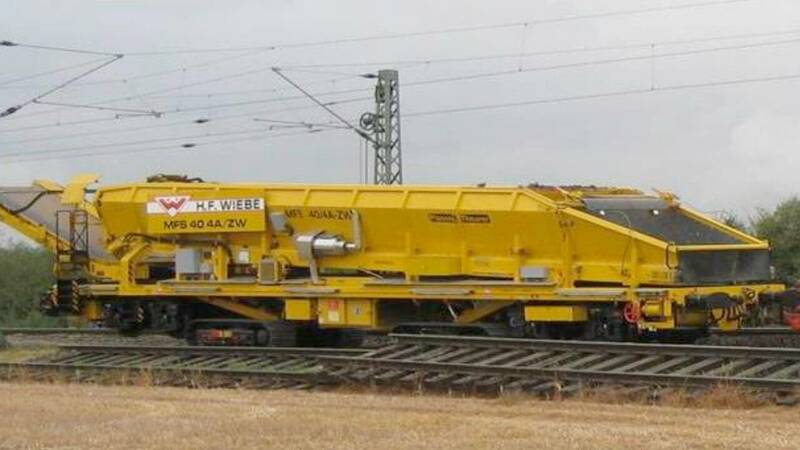 Thanks to a laser-supported 3-rail lift, even split sleepers can be processed by this very versatile track and switch tamping machine. 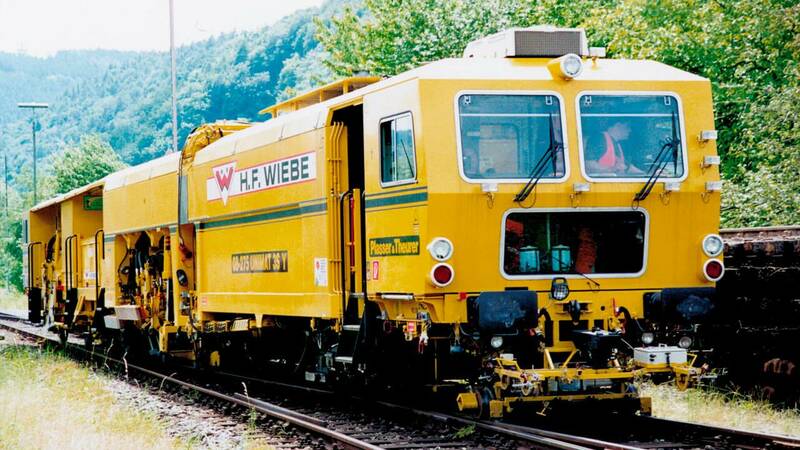 High-performance tamping of switches for all kinds of sleeper – this is the task of the WSM 08-275 3SY. 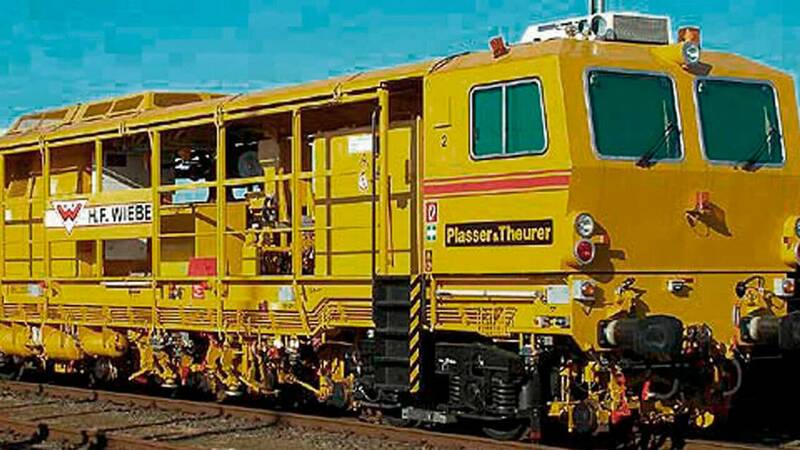 The tamping work below the switches is carried out with this switch tamping and alignment machine thanks to the 3-rail lift in compliance with the latest guidelines. 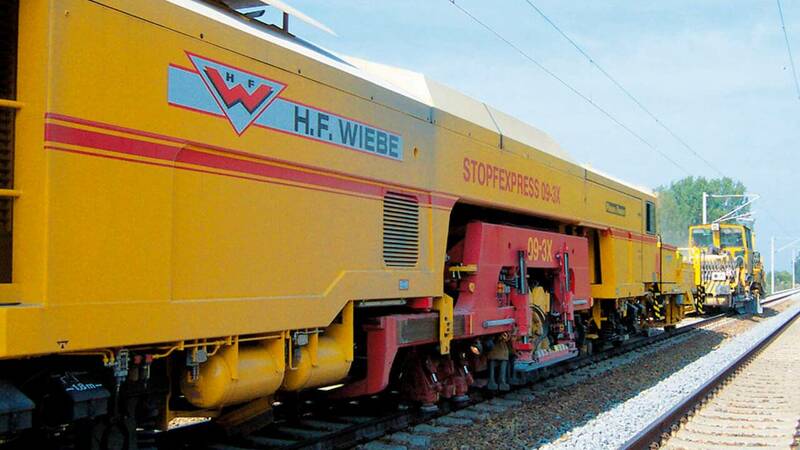 The Wiebe Group’s dynamic track stabilizer DGS 62 N uses innovative technology to achieve optimum track bed stability. 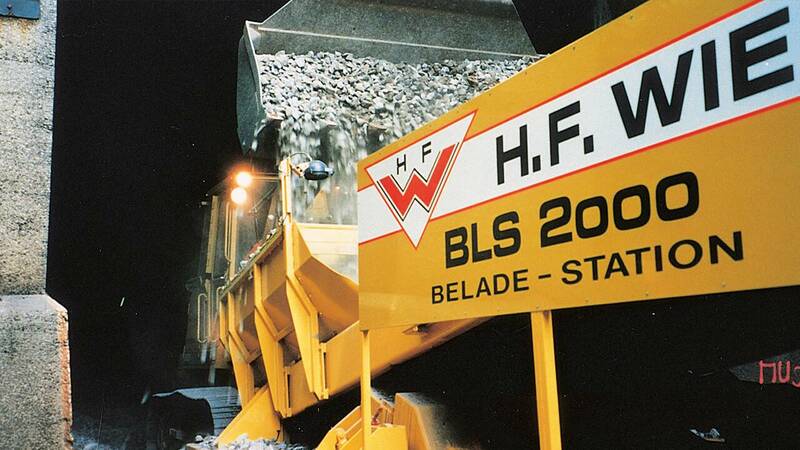 Machines of the SSP 110 SW series are approved for ballast levelling and profiling. The No. 850 is also approved for steep sections. 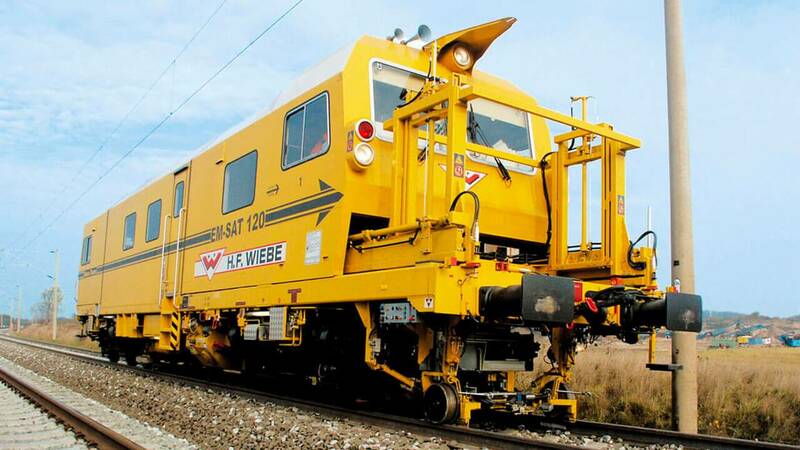 For effective maintenance of track systems, this track measuring car delivers all relevant data about the actual condition. 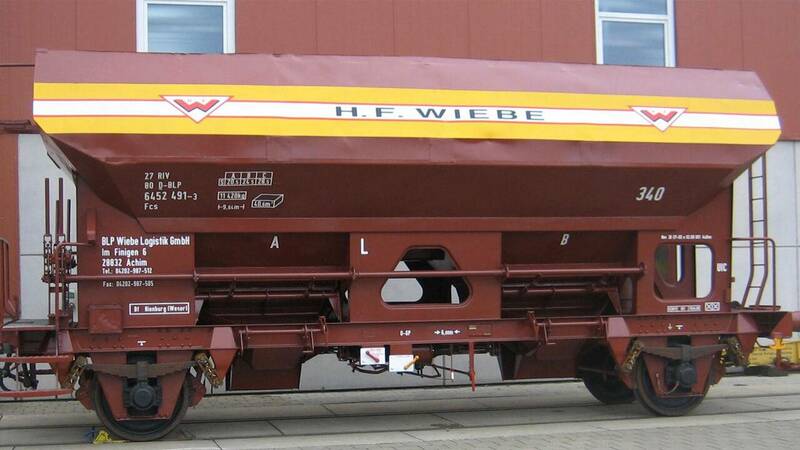 This bunker bulk goods wagon can be used as a silo or conveyor wagon. The loading station allows materials to be loaded under live cables. 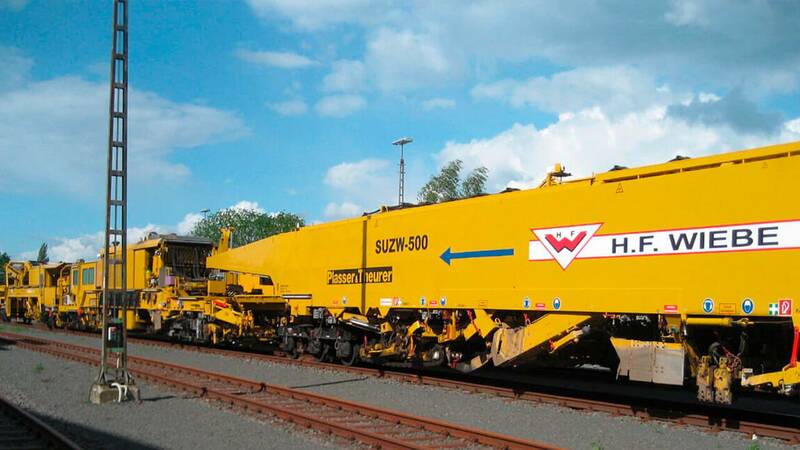 This loading station can also load materials on track-free surfaces thanks to its crawler chassis. This transfer station unloads the BSW either into storage vehicles or onto open terrain. 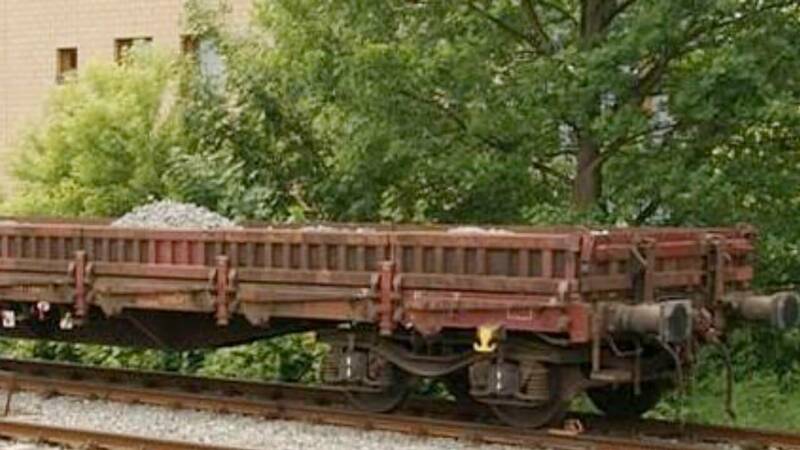 The hopper wagon is used to transport bulk goods. The two-sided compressed air tipper truck transports bulk goods of all kinds. 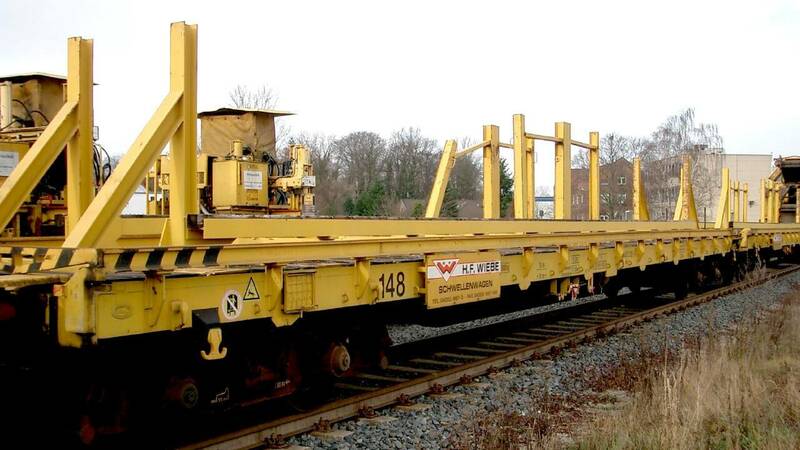 The sleeper transport wagon transports sleepers in all track projects. 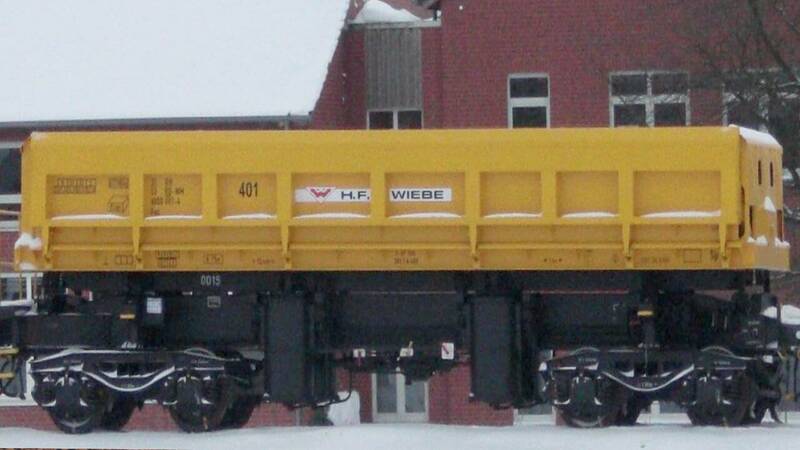 The flat wagon is primarily used to transport bulk goods. 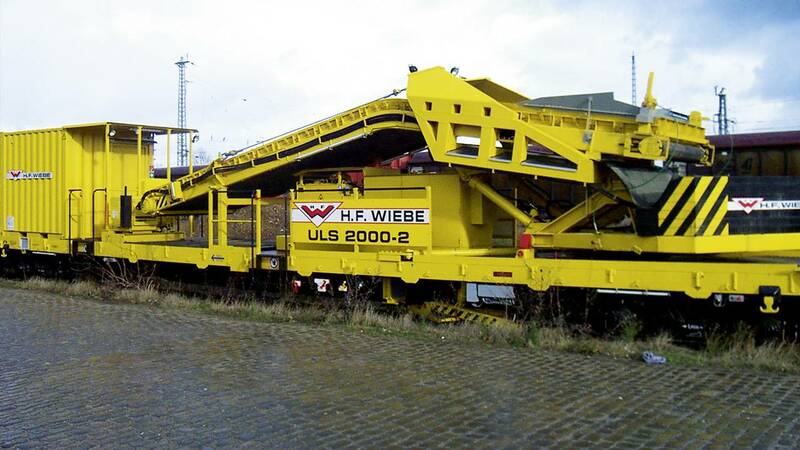 The rail construction wagon with a crane transports persons, equipment and material. 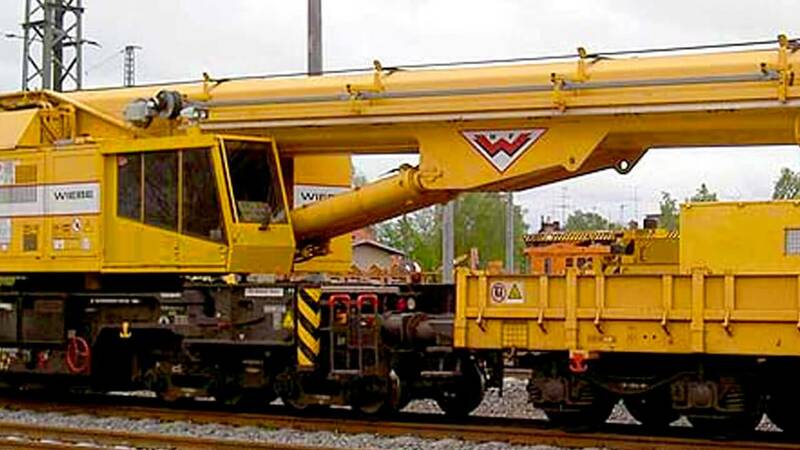 The construction crane lifts loads of up to 90 tonnes –even below overhead lines.